CinemaCon, held annually at Caesars Palace in Las Vegas, Nevada, is a gathering of theater owners and exhibitors (as well as the concessionaires and technology companies whose products undergird their business) from all across the United States and around the world. And so each spring Hollywood movie studios and top film talent alight upon the convention, to talk up their upcoming film slates and get exhibitors excited about their cinematic offerings. This year, trailers, scenes or snippets of footage from more than 90 upcoming movies were shown, including full screenings of Wild Rose, Blinded By the Light, Late Night and Long Shot. The look and feel of CinemaCon 2019 were different, however. A big part of this had to do with Disney’s recently finalized acquisition of 20th Century Fox, but Sony also made a decision to sit this year out — ostensibly opting to more selectively release looks at its films like Men in Black International, Once Upon a Time in Hollywood, Spider-Man: Far From Home, Zombieland 2 and Charlie’s Angels, rather than all at once. 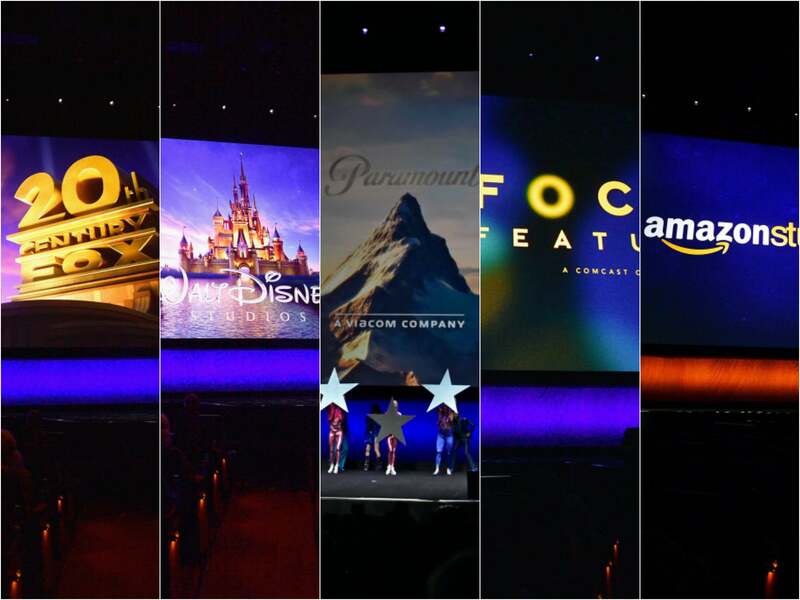 Following a day full of panels spotlighting international exhibition, technological advances, and various innovations in the consumer theatrical experience, the Hollywood distribution portion of CinemaCon 2019 kicked off on Tuesday, April 2, with a morning presentation from STX Entertainment which previewed material from eight of their releases, built around a philosophy of mid-budget genre offerings that tend to offer their stars a favorable level of creative control. 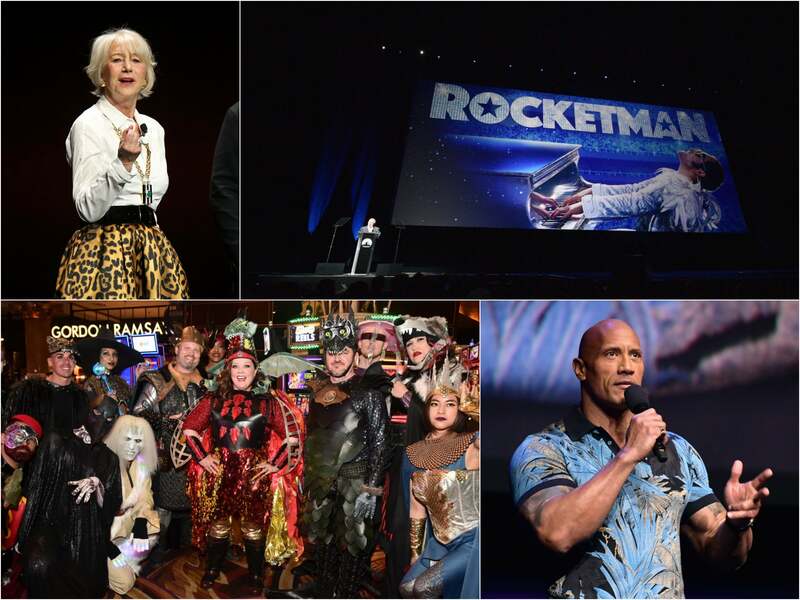 Scenes from CinemaCon: Helen Mirren makes a statement; Paramount's Jim Gianopulos presents Rocket Man; Dwayne Johnson introduces Universal's Hobbs & Shaw; Melissa McCarthy and Ben Falcone show up dressed for a different kind of convention. Charlie Hunnam and Henry Golding showed up to promote their collaboration with Guy Ritchie, the English-set crime movie The Gentlemen, co-starring Matthew McConaughey, Hugh Grant, and Colin Farrell. Following a well-received debut trailer with all sorts of stylishly lensed violence and cursing, the pair talked about how they clinched their roles. For Hunnam it was a three-hour meeting over tea with Ritchie; for Golding, it was quicker and with a different beverage, in a one-hour sit-down with whiskey. STX closed its presentation with a showcase of an animated property on which it has bet big: Ugly Dolls. If Kelly Clarkson’s live performance of the anthemic, uplifting song “Broken & Beautiful” is any indication, the franchise’s hopes seem solid. Introducing a first look at his movie Joker, starring Joaquin Phoenix, director Todd Phillips kicked off Warner Bros.’ 22-film slate presentation by waxing rhapsodic about the three months he lived onsite at the Caesars Palace while shooting The Hangover (“Stay away from room number 3952,” he joked), before sharing a trailer which seems to definitely promise a singular take on this iconic character. Warner Bros. would close its presentation with a look at It: Chapter Two. Director Andy Muschietti came out onstage carrying a massive number of red balloons, and was eventually joined by his movie’s cast — both the kids from 2017’s box office hit, and the actors playing the adult versions of their characters, including Jessica Chastain, James McAvoy, and Bill Hader. Muschietti replayed his promise from 2017’s CinemaCon, advising that audiences were “going to need plenty of adult diapers” while viewing the movie, before sharing an effectively squirm-inducing scene. Universal’s presentation on Wednesday morning offered up a mixture of cuteness (the aforementioned Haddish and Kevin Hart brought a Shih Tzu and a fluffy but amusingly restless rabbit onstage to tout The Secret Life of Pets 2), mannered class (a first look at Downton Abbey), and brawn (Dwayne “The Rock” Johnson and Jason Statham talked up their Fast & Furious spin-off Hobbs & Shaw). Octavia Spencer said that Ma showcases the lingering effects of bullying, but the horror-thriller’s trailer seemed to indicate that it will mainly have teenagers seriously reconsidering whom they ask to purchase beer for them. Closing the morning session were eight minutes of behind-the-scenes footage from Cats, heavy on performance capture and cast and crew interviews, followed by a performance of “Memory” by Jennifer Hudson. Paramount also rolled deep at CinemaCon 2019, with footage from 20 movies, including (Cannes bound) musical biopic Rocket Man and the introduction of what the studio no doubt hopes will become franchises in the form of Dora and the Lost City of Gold and Sonic the Hedgehog. The latter received an amusingly bifurcated treatment. After one trailer introduced by James Marsden, Tika Sumpter and Ben Schwartz, co-star Jim Carrey strode onstage, eating theatrically from a giant bucket of popcorn that he then emptied by tossing on the front-row audience, and arguing that the movie should, in fact, be titled after his villainous genius character, Dr. Robotnik. In mock acquiescence, an entirely separate trailer was then shown. 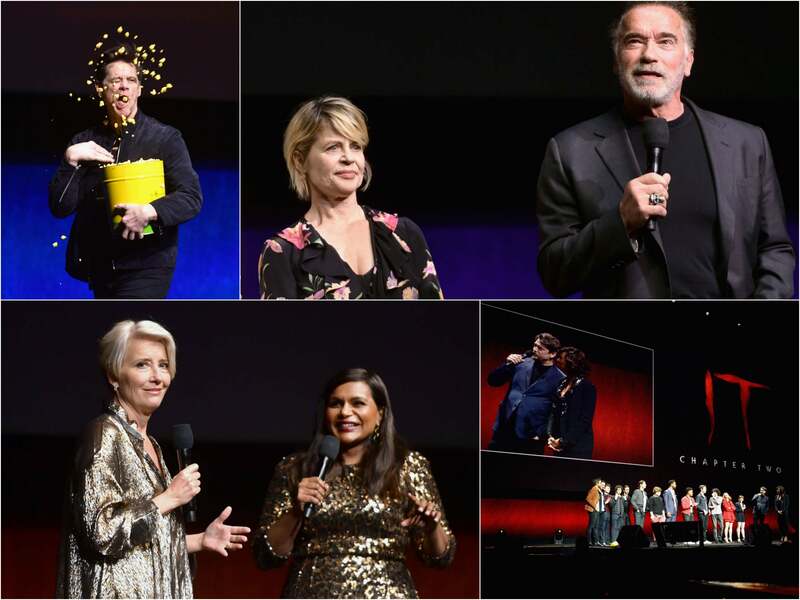 More scenes from CinemaCon 2019: Jim Carrey is a popcorn fan; iconic Terminator duo Linda Hamilton and Arnold Schwarzenegger; the It crowd; Late Night team Mindy Kaling and Emma Thompson. Arnold Schwarzenegger, Linda Hamilton and the rest of the primary cast then appeared onstage to introduce two extended scenes, which was well received by the audience. Among its callbacks and twists is the fact that now the Terminator can separate into two so that he’s twice as deadly. Hamilton, meanwhile, elicited the biggest reactions, for a sequence in which she blasts one Terminator with a hail of machine gun bullets and another with a bazooka. Rounding out studio presentations on Thursday, April 4, Lionsgate delivered a streamlined pitch, with only passing mentions of anticipated movies, like director Jay Roach’s ensemble drama Fair and Balanced, or Sylvester Stallone’s franchise-closing Rambo: Last Blood. Instead, Halle Berry and director Chad Stahelski shared footage from John Wick: Chapter 3 (which adds trained canine assassins to its balletic, over-the-top action mayhem), and Jamie Lee Curtis, Ana de Armas and writer-director Rian Johnson introduced a stylish trailer for Knives Out. “I’ve always loved Agatha Christie,” said Johnson, “and this movie is my attempt to do that type of ‘whodunit,’ to jam it into a movie with an all-star cast, and set it in modern-day America.” Closing out Lionsgate’s presentation, after the announcement of a new partnership with Seth Rogen’s Point Grey Entertainment, Charlize Theron and Rogen personally introduced a screening of their new comedy Long Shot, fresh off its premiere at SXSW. Only time will tell how right Neuhauser is. After all, as many noted during the week in Las Vegas, predictions of the theatrical marketplace’s death or downward spiral have been a hallmark of its existence for decades, with the advent of each new technological innovation. One thing is certain, though — more change is coming, and Hollywood studios and their partners in exhibition will again have to adapt.